English riding pony. Bay, brown or mousy dun, with no white markings; 12.2 to 12.3 hands high. THE 'last minute' Endurance GB Pleasure and training ride at Slaley Forest raised PS260 for the Moorland Mousie Trust - a charity which supports the rare Exmoor pony and is close to the heart of Juliet Rogers who kindly gave permission for her venue to be used for the ride. It was here that we had a chance encounter with an elderly motorist who - like us - had pulled into a makeshift lay-by to watch an Exmoor pony, and her foal, quietly munching their way through an all-day breakfast. Deborah Davy, 53, revealed the oneyear-old Exmoor pony was served up at a dinner party. 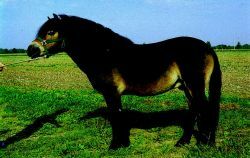 uk * Exmoor Pony Centre, Ashwick, Dulverton, Somerset Tel 01398 323093, www. When it comes to animals, the farm has plenty of rare breeds, as well as a chance to have a go with the curds and whey New arrivals at the farm include Primrose the Exmoor pony and Conrad the shorthorn calf. They help their mum to care for the three horses kept at home - an Exmoor pony called Henry, an elderly Welsh mountain pony called Mickey and a 27-year-old thoroughbred, Dillon. TOMORROW Go for a guided walk by Exmoor pony expert Val Sherwin in Sutton Park, Sutton Coldfield looking for the wild ponies there. Jerry: The Story of an Exmoor Pony, London: Eyre & Spottiswoode, 1930. The Stokesley School pupil was competing in the event held in Selby with Billy, a nine-year-old Exmoor pony. An Exmoor pony stallion, called Lance, has been grazing on lowland heath at Chapman's Well, near Quaking Houses, Stanley, since February to help improve the growth of the heather. MAN EVENT: One of the Exmoor pony colts in the field at Ryton- on-Dunsmore, and (left|) Mandy and Nigel Hill with one of the latest editions to their herd.